The Indigenous People of Biafra, IPOB, has threatened to drag former Abia State Governor, Orji Kalu alongside the Chief Army Staff, Lt Gen Tukur Buratai over the disappearance of its leader, Nnamdi Kanu. In a statement issued on Sunday by its spokesperson, Emma Powerful, the pro-Biafra group warned of an impending attack on South East Governors and all those who opposed their cause. The statement reads, “IPOB through her lawyers will compel Orji Uzor Kalu to appear in court alongside Buratai on the October 17, 2017 to tell the world, under oath, what he claims to know about the whereabouts of Mazi Nnamdi Kanu. “His laughable assertion that the IPOB leader is in London is confirmation that all along he has been working in tandem with Gov. Okezie Ikpeazu, Willie Obiano, Rochas Okprocha and others to slaughter as many IPOB family members as possible in order to please the core North. “Any right thinking person, aware of the dubious upbringing of Orji Uzor Kalu and his fraudulent paternity claim against the famous businessman Nnanna Kalu, a man that publicly denied him, should dismiss his latest antics as another calculated attempt to endear himself more to his Hausa Fulani Islamic handlers. “The question Orji Uzor Kalu must answer is this, if indeed you are Nnanna Kalu’s son, why do you tell people you come from Igbere when the man you fraudulently claim is your father is not from there. “Our leader Mazi Nnamdi Kanu before his abduction by Nigerian Army has brought an end to the era of cash and carry politics politics of subservience to Hausa Fulani to the detriment of Biafra. That was why he flatly rejected your monetary offer to him to compromise his uncompromising stance on Biafra restoration. “Thankfully today you have told the world that Nnamdi Kanu cannot be bought. The politics of selling the interest of the East to the North is why all Hausa Fulani stooges in government houses across the South East ganged up with their Hausa Fulani masters to kill Nnamdi Kanu and proscribe IPOB. Their wish having come through, they are now lining up to exonerate the military because they know their names will be mentioned as accomplices to mass murder of IPOB family members. 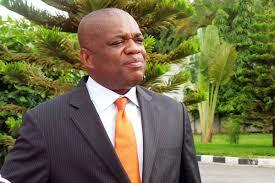 “Orji Uzor Kalu and his co-conspirators must await the fury of the people which is slowly building up. The same way Romans rose against the murderous Brutus and his gang that slayed the popular Julius Ceasar, so will the mob in Biafraland descend on all traitors in no distant time. Planning and executing the mass murder of IPOB members including our leader and looking to cover up your complicity with bare faced lies, will expose and render Orji Uzor Kalu inconsequential and expose him for the Hausa Fulani slave he truly is. The masses will set an example with the likes of Orji Uzor Kalu, Okezie Ikpeazu and Willie Obiano in no distant time that other quislings like them may learn.